Whatever it is you are looking for in a mattress, Sleep Concepts has got a solution for you. 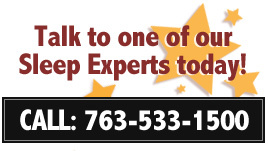 Visit one of our Sleep Experts today and let us help you find the mattress that fits your needs, lifestyle, and budget. Mattresses by Corsicana, Serta, Simmons, Stearns & Foster, and more. Our Factory Direct Mattress Showroom in Brooklyn Park features an entire line up of traditional innerspring and pillowtop mattresses for you to choose from. From soft to firm and everything in between, we are confident that you can find what you are looking for at our specialty Mom & Pop Mattress Shop. Sleep Concepts Mattress Factory has been providing affordable, quality sleep products to the Twin Cities market for more than 22 years. We keep most of our products In Stock and are happy to offer an inexpensive, Quick EZ Delivery on all of our bedding products.